Grove Street Farm, affectionately known as La Finquita (Little Farm), dominates the bustling intersection of Grove Street and Myrtle Avenue in Bushwick. 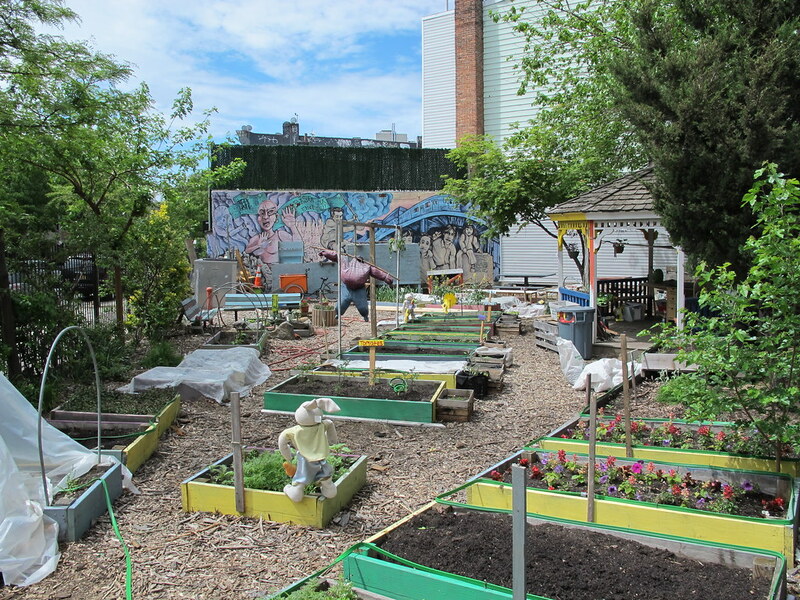 In a neighborhood that is home to one of Brooklyn’s largest immigrant populations yet also has the smallest amount of green space, this vibrant community garden serves as a green haven. La Finquita is managed by Make the Road New York (MRNY), a nonprofit with the mission to build power in working-class communities of color through grassroots organizing, paired with survival, legal, educational, and health services. Once a trash-filled lot, the farm was born when MRNY members and neighbors came together over ten years ago to create La Arboleda de los Niños, or the Children’s Grove. Now, La Finquita produces a wide range of fruits and vegetables, many grown from seed brought from gardeners’ home countries—plants like pápalo, epazote, alaches, and habanero chiles from México, and gandules from Puerto Rico. 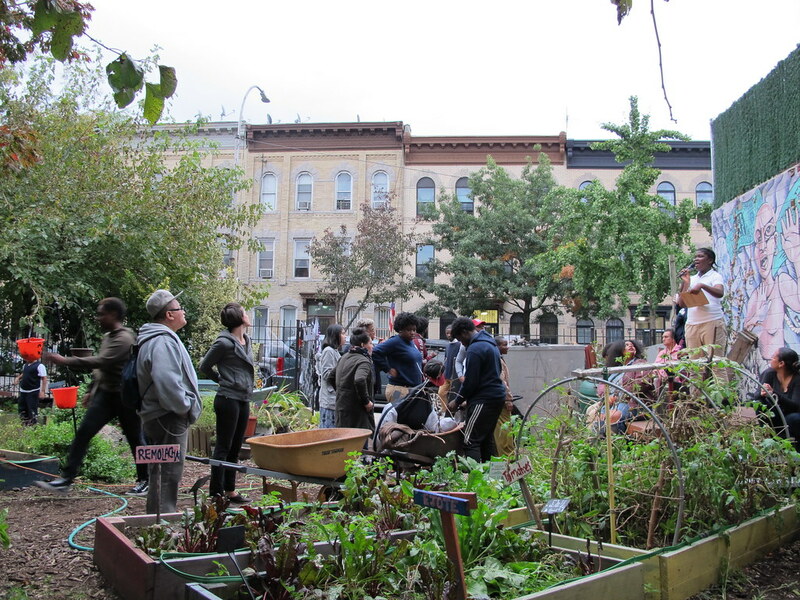 Produce and herbs raised here are shared by all farmers and volunteers and incorporated into MRNY’s weekly food pantry. Seasonal workshops and events encourage members to celebrate the fruits of their labors. English language learners, community health workers, and others use the garden for learning, celebrating, relaxing, and connecting with the earth. Carla Rodriguez and Amy Richards Carla Rodriguez is community outreach instructor at Brooklyn Botanic Garden. Amy Richards is health projects coordinator at Make the Road NY. Hi, I loved your article of hope and gardening in NY City! I wonder if you have any information on how to start such a project in other cities. We humans need to reconnect with nature and help our children find their way back to the joy of gardening. Community plots at Grove Street Farm in spring. Photo by Carla Rodriguez. The annual Fall Festival takes place in October. Photo by Carla Rodriguez. 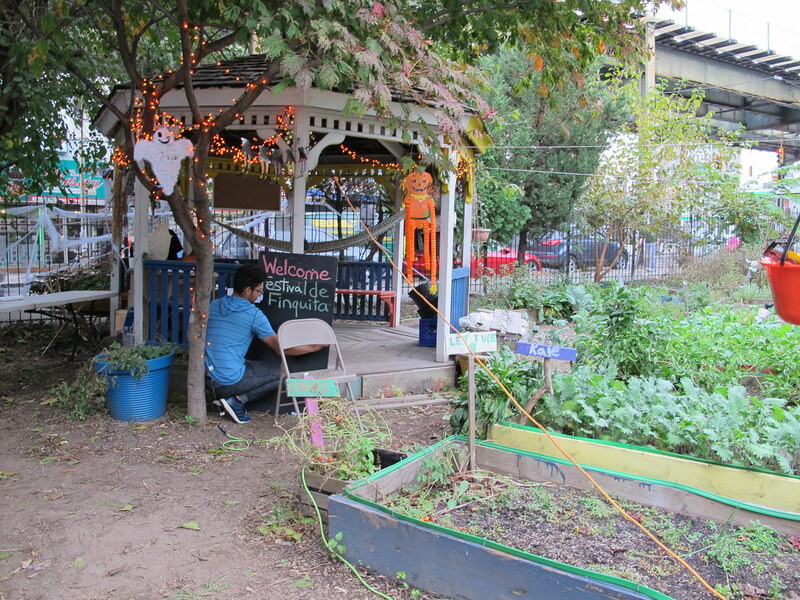 In the fall, the plots are filled with vegetables and greens and neighbors join La Finquita members for the festival. Photo by Carla Rodriguez.